It is very important for a designer to know that what he is supposed to make, how well he implements his idea is the second thing. For every thought begins from a chain of perceptions and notions that are formulated and transformed. There are things that are to be kept in mind while making a design. A: It should be vocal and not ambiguous. B: It should be meaningful and communicative. C: It should be exactly the way the client wants it to be. When a designer keeps a check and balance of these salient features, his game is almost sorted out. Then success is in the menu and he can play his cards well on the table. For him, it is also vital to live up to the expectations that are reckoned from him, because the client can go elsewhere too if he is not fully satisfied. So make sure you give in your best self into your respective tasks so he comes back to you over and over for more projects. From the beginners to the way of professionals, we see a variety of ideas being packed into compositions, because the thought process of every artist is different and it is the way how they perceive and conceive ideas that matter in the long run. Never underestimate the power of your imagination, it helps you to think widely, and to make impossible totally possible. 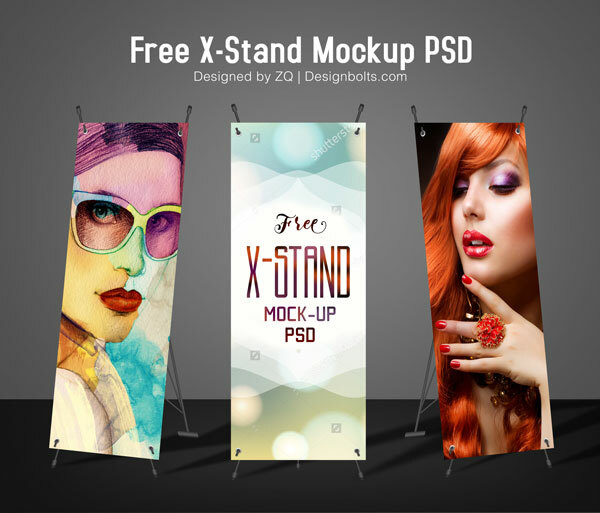 Well here I have designed something for all those designers who are currently working or foreseeing the projects of X-stand, here get the free high quality X-Stand banner Mock-up PSD. You don’t have to invest time, but by simply adding your own design into this X-Stand will help you a lot to make a decent and outgoing presentation for your clients. This X-Stand can be placed outside the shops/markets as a product display of brand or product. Do come back for more is yet to come in your way in future as well, I appreciate your subscription because it makes me know that you are connected to the blog for sure! Thank you for the mock up. Is there a way I can place one image across all 3 smart objects?